So much has happened since my last post! 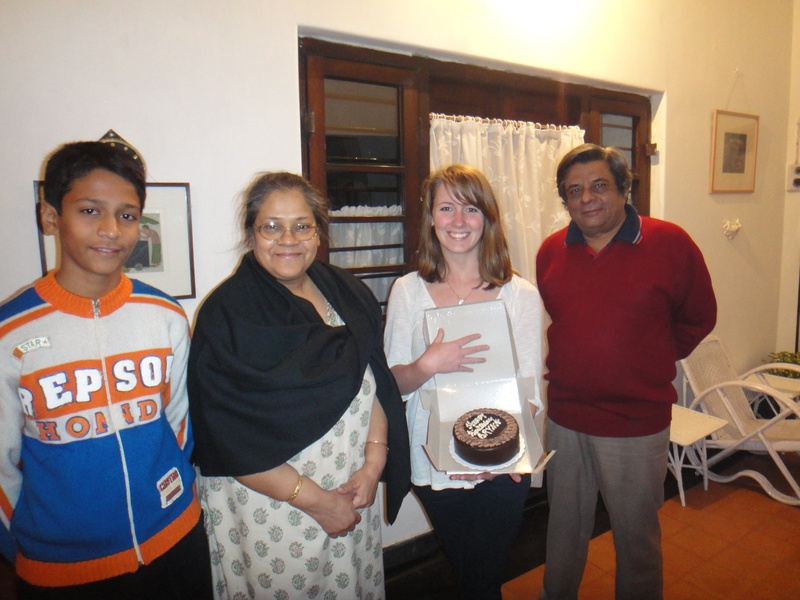 It’s been a whirlwind as we finished off our 10 day tour with visiting Delhi again and Agra before we headed off to Kolkata to get settled in with our host families and begin attending classes at St. Xavier’s. 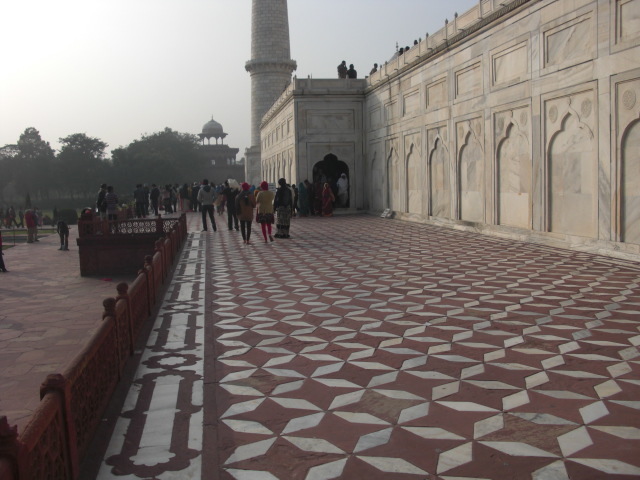 A little over a week ago, we went to Agra to see the famous Taj Mahal. We left Delhi around 630am for what should have been a 4-hour drive to Agra…but we had a driver who wouldn’t listen to Madhu and insisted on taking us on the backroads instead of the highway. Horribly bumpy village roads that aren’t meant for tour buses, as people were literally bouncing out of their seat. Imagine MN potholes on steriods and covering the entire road. Even if these backroads were a shortcut as the driver was saying, it took more time because we couldn’t drive quickly. Madhu eventually convinced him to go back on the highway, but we were so far off course by then that it probably took more time to get back to the highway rather than just finishing the backroad route. With the stop for lunch included, our 4-hour drive took 8 hours. In addition, the bus was freezing. Literally almost freezing – about 34°F. 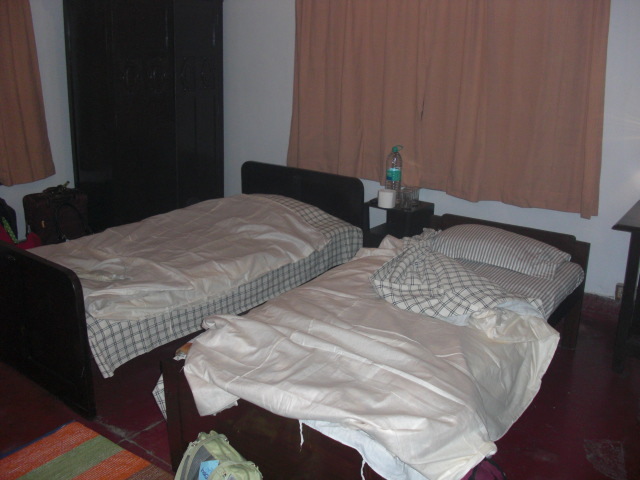 It wasn’t a very easy bus ride for me, as I had started to get sick the night before with “Delhi belly” – the stomach/intenstinal plague of indigestion and diarrhea. I started to get a fever and chills on the bus as well, so it wasn’t a very comfortable ride. However, seeing the Taj Mahal was worth the long bus ride and sickness! The second we stepped off the bus, we were assaulted by various peddlers selling Taj Mahal figurines, shoes, bull whips, books, and more. The slightest glimmer of interest will only encourage them, so it’s best to just not even look if you’re not interested. Sometimes a polite but firm “no” will deter them, but others will just pester you more. After making our way through the mass of peddlers, we were on our way to the most famous tourist sight in India! 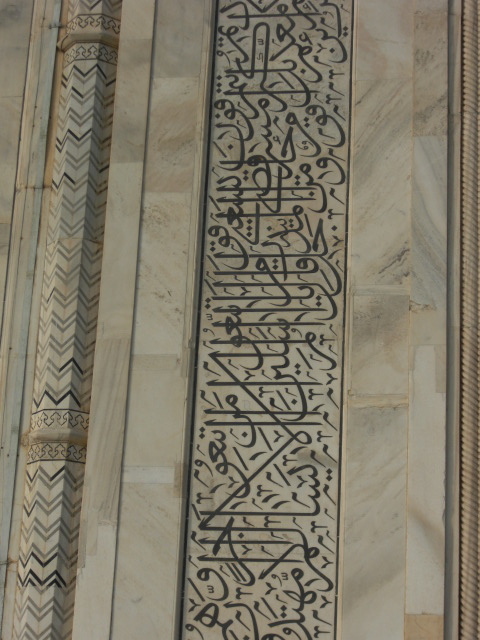 The Taj Mahal is very beautiful with so many intricate designs. We had to wear little shoe covers, thankfully, rather than taking off our shoes like you need to do at many sights in India. There is not a lot to see inside the Taj Mahal, just the tombs in the main central room, and then the surrounding chambers are empty. It was built by emperor Shah Jahan in memory of his wife Mumtaz Mahal after she died giving birth to their 14th child, and their tombs are inside the Taj Mahal. We briefly toured Agra Fort before heading back to Delhi, but Agra Fort was very similar to the Red Fort in Delhi, and I wasn’t feeling well at that point. 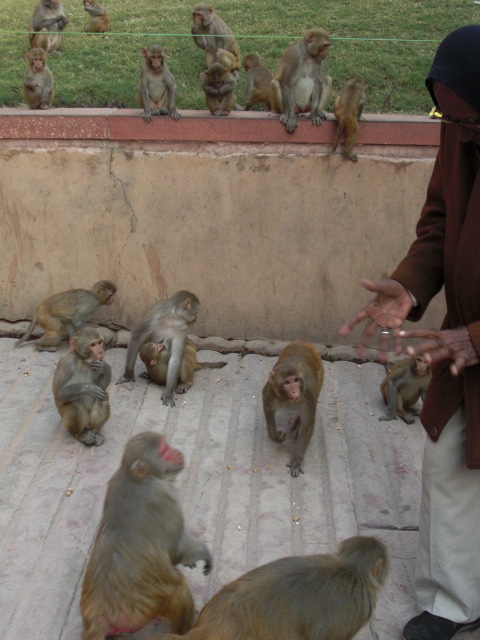 The coolest part of the tour was a ton of monkeys at the entrance gate! We spent our last full day in Delhi shopping. On our way to a big craft market, we stopped at the biggest Hindu temple in India. It was amazing to see – literally every surface is carved, bejeweled, or decorated. There are so many Hindu gods and stories, it will take a while to learn even the main ones. The craft market was fun – there’s always so much to look at and buy! We also stopped at FabIndia, an Indian clothing store that’s like the GAP of India. It was nice to buy some Indian clothes, but the experience was a little different than shopping for clothes at home. Luckily, Madhu gave us a brief explanation on Indian clothes and how you wear them, so we had a small idea of what to look for. Since we’re not quite ready for saris yet, we were looking for a kurta (like a long tunic) and churidar (leggings that bunch up at your ankles). Kurtas can also be worn with a salwar (looser pants). The whole ensemble can be called salwar kameez, and can be worn with a scarf called dupatta. In the store, the kurtas are organized by size and length of the kurta (mid thigh, knee) and length of the sleeve. On top of that, there are so many patterns and colors to choose from! It was a little overwhelming, but I ended up buying 2 kurtas. It will be nice to go shopping again to have some more clothes that aren’t so Western and more suitable for the weather here. 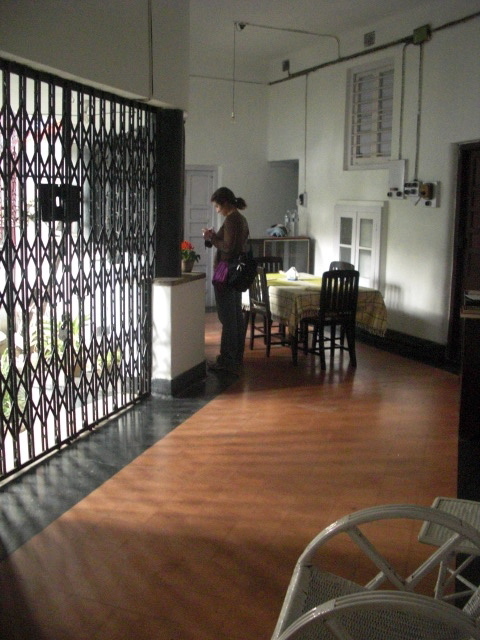 The next day, we flew to Kolkata and spent the night in a very nice Western hotel, resting up from traveling. 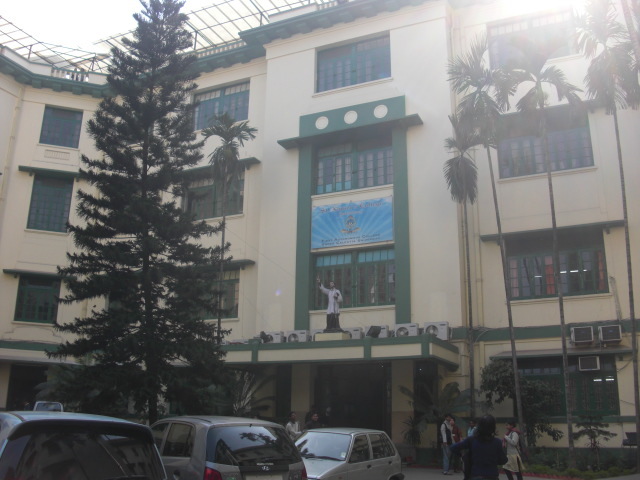 The following day, we went to see St. Xavier’s College, where we will be taking classes for the semester. 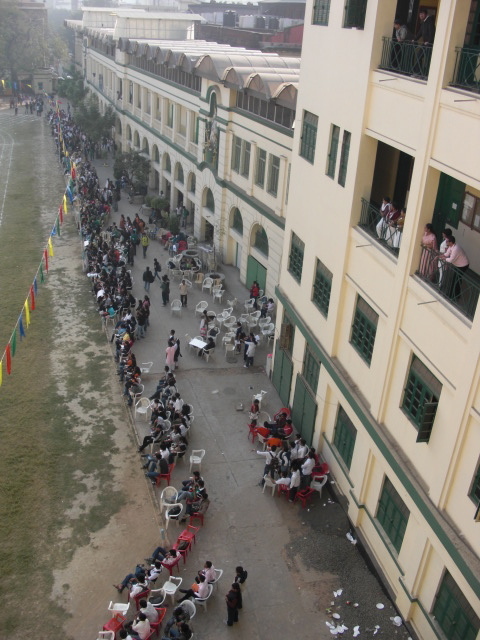 There was a big event going on that day – sports day – and 4,000 students were there! They were there to be in a student parade around the track, representing their majors, and we got to be in the parade. We were our own section with a sign, “Visiting Students – College of Saint Benedict/Saint John’s University – Minnesota.” As if we don’t draw enough attention to ourselves normally (no hiding this blond hair and pale skin), we were officially directing attention to us. It was fine though when people cheered a lot for us. There was actually quite a bit of ceremony for sports day, including speeches from the president of the college, honored guests, and a dance performance. The sports part was kind of like a track meet, with mostly track events but then some other things like tug-a-war between students and teachers. It was more about solidarity than competition. 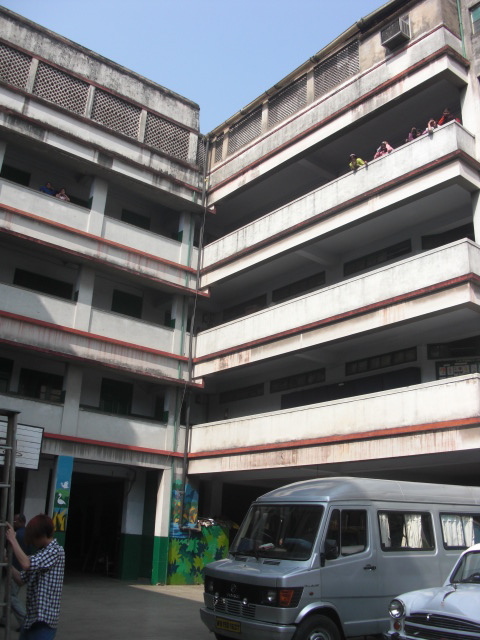 We got a little tour of the school next – 4 floors of classrooms that have pew-like desks. We had our first experience of a kind of street food afterward – a chicken egg roll. They fry a tortilla-like bread in egg and oil, and then roll some chicken, chillies, and onion inside. It was pretty good, but I couldn’t eat fried food like that every day! the family is still an adjustment, since we have only been here a few days and we’re not into a routine yet. They are very nice and love to talk with us, but we still have a kind of formal relationship. For example, they will sit with us while we eat but they don’t eat with us. We haven’t seen the upper floor of the house yet, where they live. We’re not sure if it’s a privacy thing, or a cultural thing, but we haven’t quite been “allowed” to see the upstairs yet. I’m sure it will become less formal as we get to know each other better. 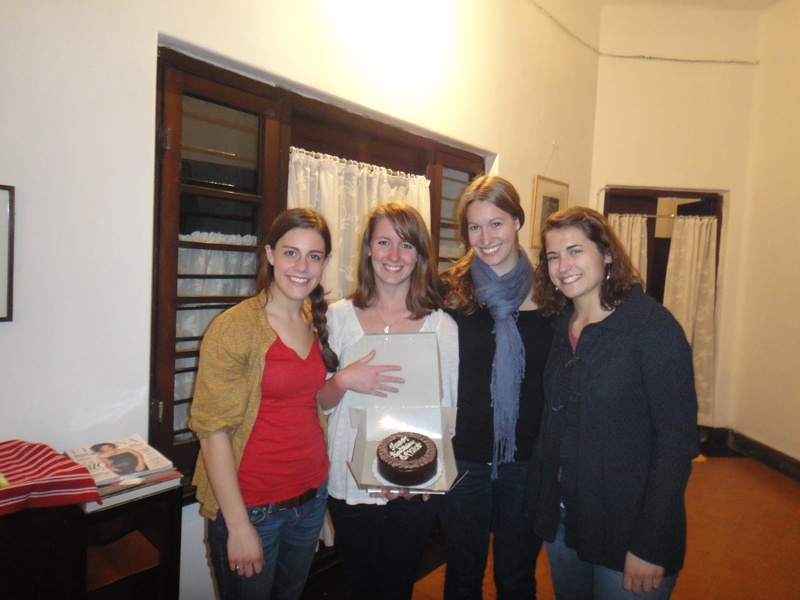 It’s great living with these girls though – they are all so nice and we get along really well. We’re getting to know one another really quickly! Classes have started (in theory). Because this is the first exchange program, most of the details are not sorted out. It’s been very confusing trying to get class schedules worked out, and the schedule has already changed a few times. I’m taking an elective sociology class here called Indian Institutions, which will be about family, marriage, education, religion and some other topics. 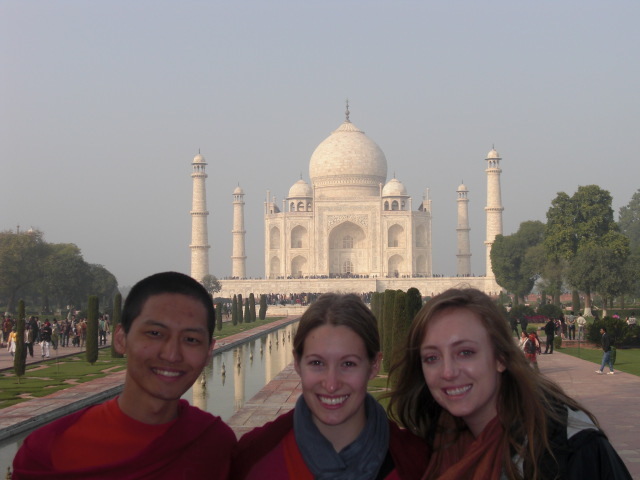 Madhu, our director, is teaching our study abroad seminar which will be studying Indian culture through literature. I also have a kind of “India 101” class, and I will be learning a little Bengali language and about Bengali culture. Apparently, the normal teacher for part of the sociology class is on academic leave through the end of January, so I’m not sure if that class will meet until she comes back. I had my first “real” class today – and it was quite a bit different from St. Ben’s. It was the religion part of my sociology class, and there were about 30 people in the class. The students were very friendly. 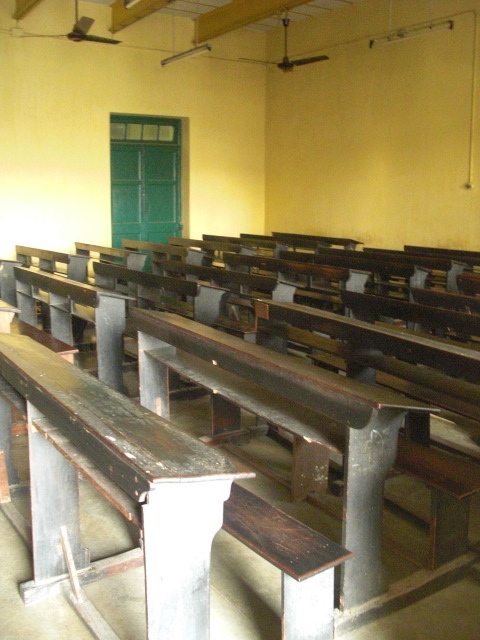 The teacher stood at the front of the class and lectured for the hour, and when she would ask a question, about 10 students would respond at once. Each time a student addresses the teacher, it’s followed by “sir” or “ma’am,” and the students stood when the teacher entered the room. The teacher takes roll, and the classes begin and are excused by the bell – it reminded me so much of high school! The students were very nice, but they seem young even though we are about the same age. Today’s class was not very interesting, as the teacher was talking about things they had studied the previous semester – about different sociologists’ views on religion. I don’t expect there to be much discussion during the semester, which is one of my favorite parts of classes at St. Ben’s. We also had Madhu’s class today, but we did things like paperwork and general discussion of how things are going rather than classwork. It looks like I’m going to be in class quite a bit here, but I’m not sure how much homework we’ll have. In addition to class time, we’ll be doing some volunteering at Loreto Day School. We stopped by there earlier this week for a little introduction, and it looks like it will be a great place to volunteer. There are several programs to get involved in – you can help during the normal school hours, with the Rainbow kids (who came from off the streets and now live at the school), with teaching in the villages and slums, playing with the kids, and so much more. It’s all started and run by Sister Cyril, an amazing woman whose philosophy is all about solidarity more than charity. I’m excited to learn more about it and what we’ll be doing there. I’ve started to feel better after taking some antibiotics, and we’re starting to develop a routine and get things sorted out here. It will be nice when we’re more in the swing of things – know the city better, have more Indian friends, and know a little more about the culture! When you take a taxi here, the meters are really behind the times, so you have to double the meter plus 2. so, a ride of 20Rs would be 42Rs. You must dress very modestly compared to home. You never show leg and must wear a scarf if you have an open neckline. Everything is covered up all the time. Boys walk together with one arm around the other’s shoulder, or often hold hands. It shows friendship. Indian toilets typically don’t have toilet paper. Instead, they use a cup of water to rinse. Indian showers use a cup and a bucket instead of continuously running water. You have to turn on the water heater to get hot water. English is widely used, though with British terms. 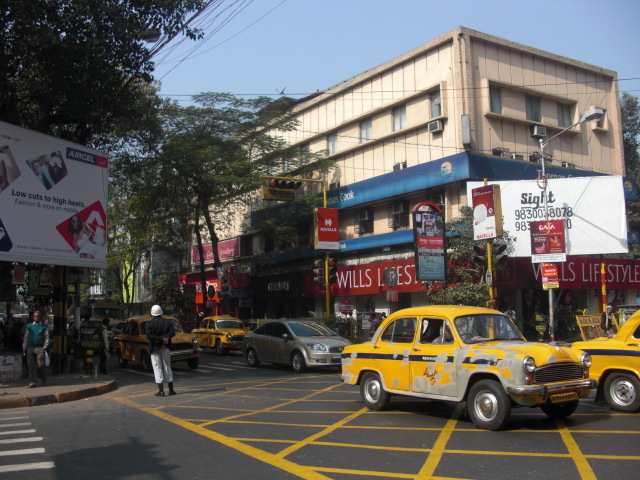 The streets here in Kolkata have both an old British name and a new Indian name, and streets are known by both and some by only one name. 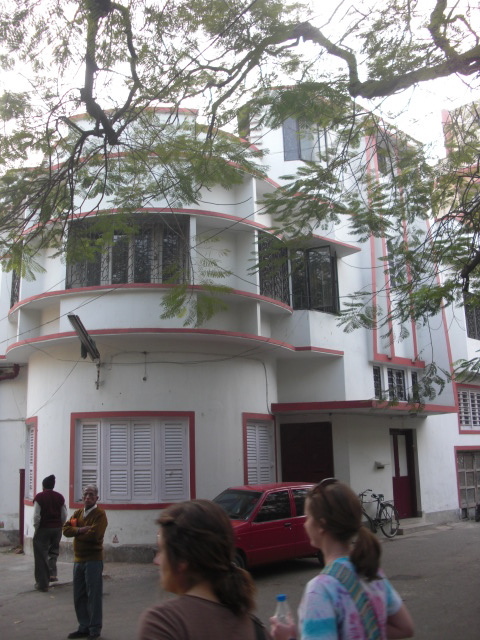 For example, Kolkata (Calcutta). The house our street is on is Garcha (Dover Place). Some maps only have one name, so someone could tell you to go on Harrington Street, when your map will only say Acharya Sarani. India is a country of extremes. On a similar note – when you find one thing to be true, the opposite is also true. 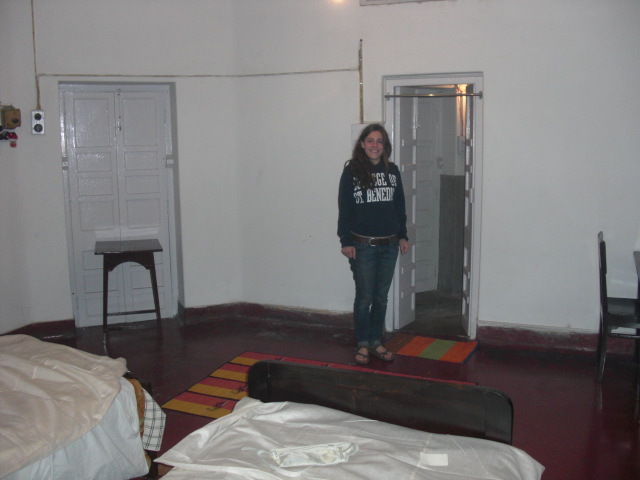 I loved reading about your experiences in India so far. It sounds wonderful and I am so happy that you are having this experience. Quite different from Cannes, huh?! Patrick enjoyed your Cannes blog so much that he wants to quote from it for the next Collège newsletter. Best wishes and I’ll look forward to keeping up with your adventures in India! Hi to Madhu and Munu!